Farmhouse Creative worked with Industrial Center Federal Credit Union with their re-branding and name change to “Thrive Credit Union“. 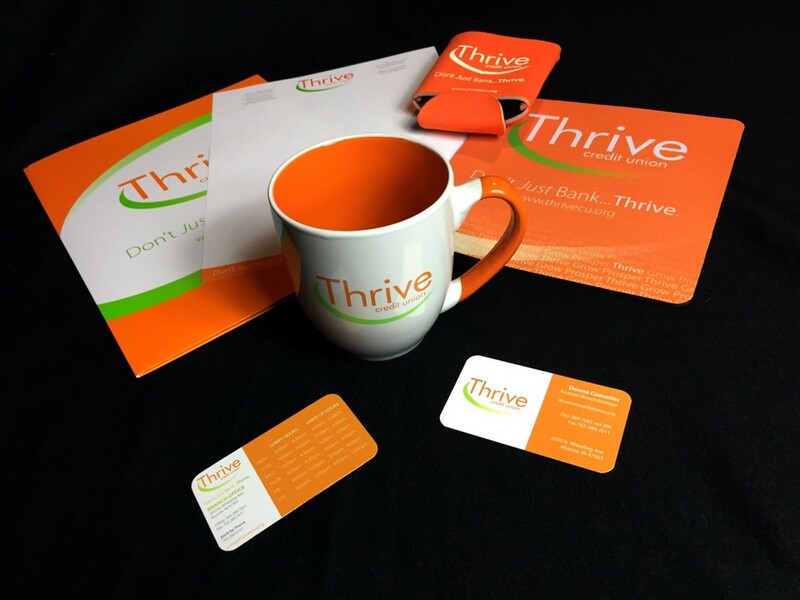 Thrive Credit Union had spent the better part a year working on their name change and re-branding efforts. They came to Farmhouse Creative with their new name and logo already established. Their marketing team wanted to know if we could help them layout their new collateral pieces such as Business Cards, Brochures, Letterhead, Folders, etc. We jumped at the opportunity! Farmhouse Creative took Thrive’s existing brand elements and guidelines into consideration and laid out pieces that captured the company’s new goals and direction. Throughout the process, Farmhouse Creative was also asked to produce promotional products and layout graphics for use adds on the bus transit system in Muncie (MITS). A complete list of what was designed and/or produced for this project is listed below. Both Farmhouse Creative and Thrive Credit Union are happy to reveal this new launch. We are so pleased with the results!